As the team reports in a paper published online in December in the Proceedings of the Association for Computing Machinery on Interactive, Mobile, Wearable & Ubiquitous Technologies, a narrow, invisible beam from a laser emitter can deliver charge to a smartphone sitting across a room - and can potentially charge a smartphone as quickly as a standard USB cable. 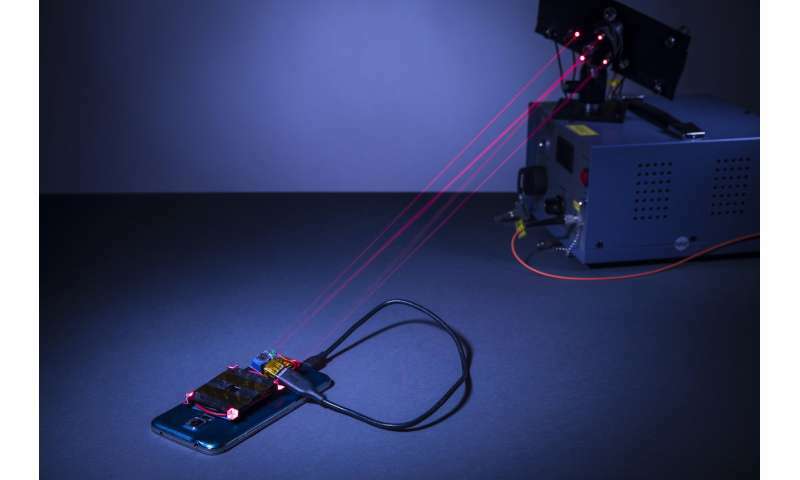 To accomplish this, the team mounted a thin power cell to the back of a smartphone, which charges the smartphone using power from the laser. In addition, the team custom-designed safety features - including a metal, flat-plate heatsink on the smartphone to dissipate excess heat from the laser, as well as a reflector-based mechanism to shut off the laser if a person tries to move in the charging beam's path. "Safety was our focus in designing this system," said co-author Shyam Gollakota, an associate professor in the UW's Paul G. Allen School of Computer Science & Engineering. "We have designed, constructed and tested this laser-based charging system with a rapid-response safety mechanism, which ensures that the laser emitter will terminate the charging beam before a person comes into the path of the laser." "In addition to the safety mechanism that quickly terminates the charging beam, our platform includes a heatsink to dissipate excess heat generated by the charging beam," said Majumdar. "These features give our wireless charging system the robust safety standards needed to apply it to a variety of commercial and home settings." The charging beam is generated by a laser emitter that the team configured to produce a focused beam in the near-infrared spectrum. The safety system that shuts off the charging beam centers on low-power, harmless laser "guard beams," which are emitted by another laser source co-located with the charging laser-beam and physically "surround" the charging beam. 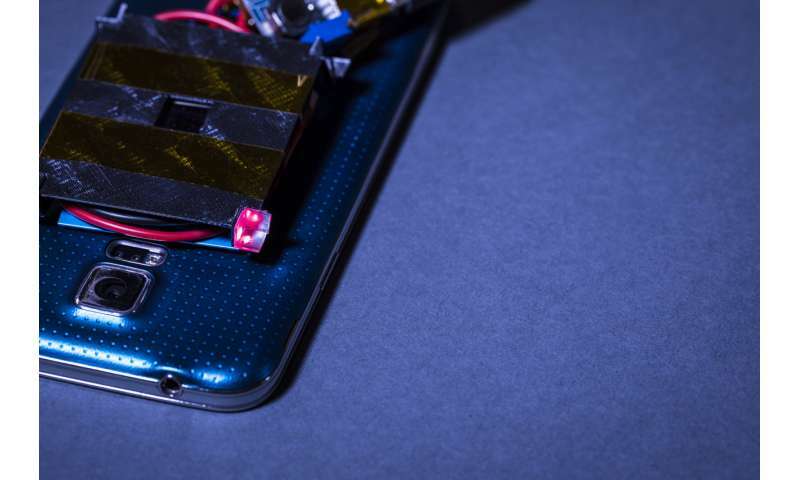 Custom 3-D printed "retroreflectors" placed around the power cell on the smartphone reflect the guard beams back to photodiodes on the laser emitter. The guard beams deliver no charge to the phone themselves, but their reflection from the smartphone back to the emitter allows them to serve as a "sensor" for when a person will move in the path of the guard beam. The researchers designed the laser emitter to terminate the charging beam when any object - such as part of a person's body - comes into contact with one of the guard beams. The blocking of the guard beams can be sensed quickly enough to detect the fastest motions of the human body, based on decades of physiological studies. The next generation of nano-scale optical devices are expected to operate with Gigahertz frequency, which could reduce the shutter's response time to nanoseconds, added Majumdar. The beam charges the smartphone via a power cell mounted on the back of the phone. A narrow beam can deliver a steady 2W of power to 15 square-inch area from a distance of up to 4.3 meters, or about 14 feet. But the emitter can be modified to expand the charging beam's radius to an area of up to 100 square centimeters from a distance of 12 meters, or nearly 40 feet. This extension means that the emitter could be aimed at a wider charging surface, such as a counter or tabletop, and charge a smartphone placed anywhere on that surface. The researchers programmed the smartphone to signal its location by emitting high-frequency acoustic "chirps." These are inaudible to our ears, but sensitive enough for small microphones on the laser emitter to pick up. 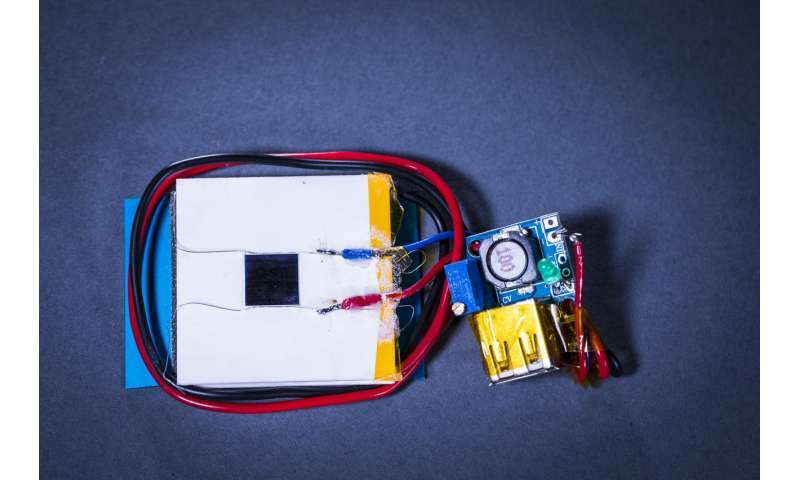 "The beam delivers charge as quickly as plugging in your smartphone to a USB port," said co-lead author Elyas Bayati, a UW doctoral student in electrical engineering. "But instead of plugging your phone in, you simply place it on a table." To ensure that the charging beam does not overheat the smartphone, the team also placed thin aluminum strips on the back of the smartphone around the power cell. These strips act as a heatsink, dissipating excess heat from the charging beam and allowing the laser to charge the smartphone for hours. They even harvested a small amount of this heat to help charge the smartphone - by mounting a nearly-flat thermoelectric generator above the heatsink strips. Why don't they just use a charger? "2W of power to 15 square-inch"
That is a pretty big collector. It has to be oriented perpendicular to the beam. BTW if someone was to place a reflective item within the beam the light could escape the safety cone and blind someone. This just looks to be some sort of grad student research project needed for graduation. "They even harvested a small amount of this heat to help charge the smartphone - by mounting a nearly-flat thermoelectric generator above the heatsink strips." Yea those microwatts sure add up fast. I guess they could do away with the guard beams if they were to modulate the charge beam with a characteristic signal and reflect part of it back. Depending on the sensitivity of the guard beam detector a deflected guard beam (e.g. by a person coming into the beam wearing glasses or some other IR reflective material) might reach the detector and the charge beam might not switch off. I can see any number of scenarios where the guard beam mechanism fails. b) people don't want to lug around chargers (and possibly adapters for all kinds of voltages) on trips. This way one could have fixed charging infrastructure e.g. in hotels. Another hoax is the microwave charging being advertised by some companies with FCC approval. I really doubt that the power levels being transmitted could be high enough to recharge a phone. The Resonant Inductive Coupling method looks to be the only thing feasible at this moment. Added in is the overall long term exposure to that high of a microwave/rf level in human occupied spaces leads to one thing: CANCER. Genetic mutation, enzyme and operational parameter change in the body, such changes due to the triggering of chemical changes via affecting the cells and blood cells.... is the kind side of the effect spectrum. the blood flows at the surface of the body, an there is also a small human electrostatic field that should not be so powerfully disturbed. Every time some illiterate jackass decides they want to power or charge their devices remotely (no wires, etc), with RF, smack them up (written/verbal, etc) and make sure they and everyone around them understands what high levels of continual RF exposure does to DNA in people. It kills them. With a very high success rate, over time. A near perfect long term exposure --- human killer. Old, new, and cutting edge research, overall... says that RF exposure for the human body is a VERY BAD THING. 1) These aren't microwaves - so what are you babbeling about? 2) They are using a laser which is a directed beam of light, so no exposure outside the beam. Again: what are you babbeling about? You miiiiight wanna be careful with such statements...because you may have noticed that you're not doing too hot on the "scientific literacy" front? "The charging laser and guard lasers are normally invisible to the human eye, but red beams have been inserted in place of the guard beams for demonstration purposes."